Bio: The Decepticons unite with Titan Master partners to power up for battle! 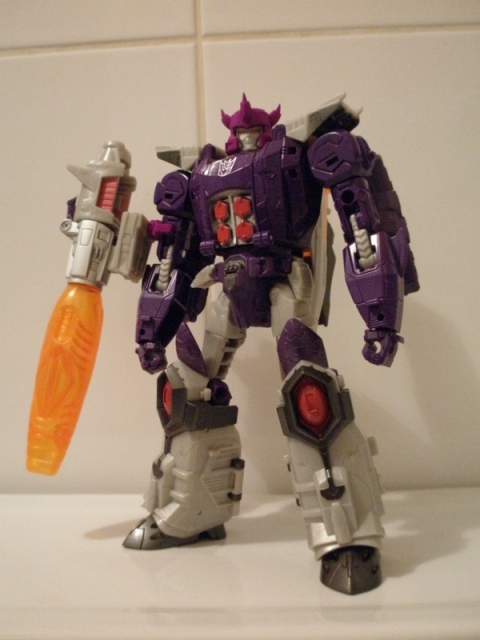 Nucleon gives Galvatron a universal systems wide upgrade with powerful but unstable results. 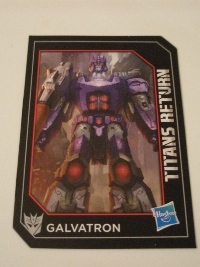 In one or more possible futures, Galvatron is the new name and identity for Megatron. Reformatted by Unicron, Galvatron is the ultimate version of Megatron, less prone to decency or emotion and with a power set that makes him the most dangerous and lethal Transformer out there. For some versions of this future warrior, his power has been tempered by an extremely unstable mental state, but this has still made him a formidable foe, moreso even. It's funny that when thinking about Decepticon leaders, it's never Megatron that springs to my mind. I'm more likely to consider Shockwave, Scorponok and Galvatron here as true leaders, thanks to the old Marvel comics that very quickly sidelined Megatron, something from which the Marvel version never really recovered from. Galvatron in particular burned brighter than most, being both a dominant force in character and appearance for over 100 issues of UK originated stories. This snarling, furious fellow has easily cemented himself as one of my favourites as a result. The character has continued to pop up in various Transformers cartoon shows since his 1986 debut, in much the same vein, being a powered up version of Megatron, which has largely just meant he's been a recolour of whatever Megatron toy has been on sale at the time. He's also recently made the transition to the world of Michael Bay, this time as a human built folly. IDW have taken a cake-and-eat-it approach to Galvatron, having him as an entirely separate character to Megatron, who was part of Nova Prime's crew and now commands the Decepticons on Earth. The toys the many versions of Galvatron have had over the years have largely been so-so, with perhaps the monstrous Leader Class Cybertron version being the best of the lot. Hasbro have dusted him down again for the excellent Titans Return line, albeit with an odd design choice that has had me reaching for the first time ever for a third party add on kit. 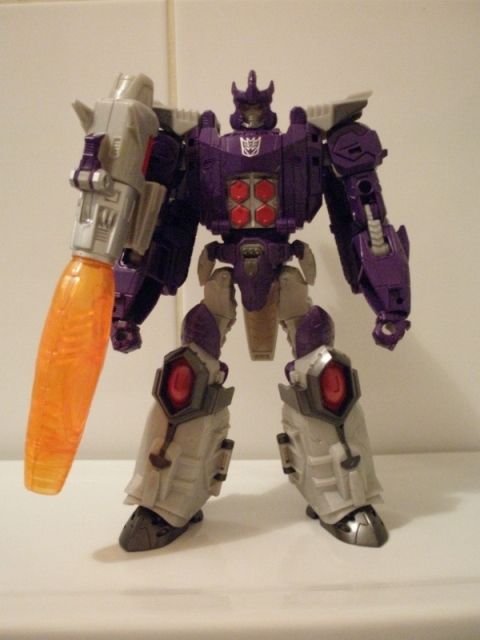 The pre-release images of Galvatron circulating online had already sold the figure to me and in hand, he certainly looks the part. He looks powerful and muscular. I like how the designers have managed to translate the animation model into plastic and given him some really nice shaping. His colours are excellent too. He's not big on paint apps, but what he does have is more than adequate and its the choice of plastic colours that really make the figure pop. 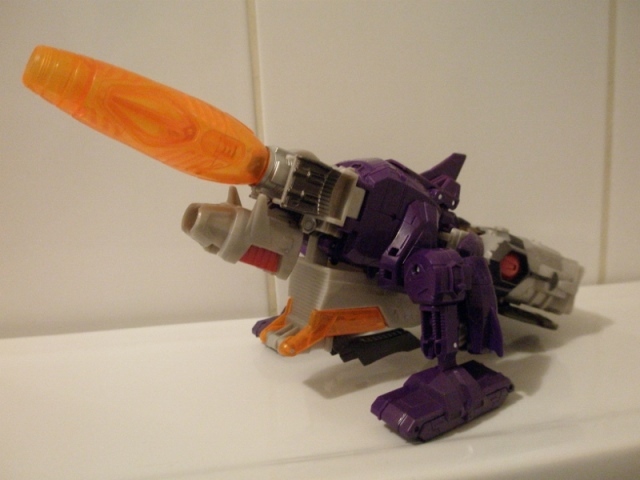 The, rich royal purple is excellent and works well with the light grey and gun-metal grey parts on the toy, along with the comically over-sized and rather phallic orange cannon barrel. He's got some superb articulation with double jointed elbows, swiveling biceps, a waist joint (it's a transformation joint, but if you angle the cockpit kibble on his back out of the way, he can make use of it) and a good range of movement in his legs. The arm mounted cannon does restrict movement in his arms (whichever you choose to plug it into) and its a shame it can't be moved out to the side so it can 'rest' more comfortably, but that's a minor flaw next to the thing that really knackers the figure. 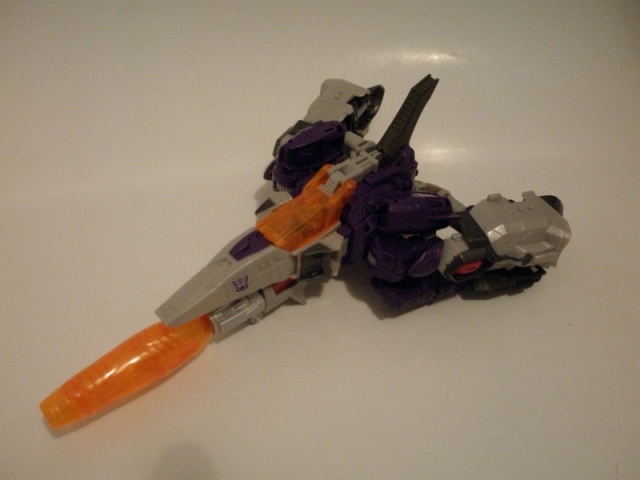 Despite the superb design work and look of Galvatron's body, this is all ruined by an appalling spring-loaded gimmick. In common with the Leader Class Titans Return figures, Galvatron's Titan Master just forms his face, so relies on a helmet to give his head the required silhouette. Sadly, rather than go for full helmet, Glavatron has to make do with a crude spring loaded battle-mask that pops up in front of his face. It looks rubbish. And not only that, but it hampers any movement of the head. The money wasted on adding in the spring loaded feature would have been better spent engineering a full helmet that could have been housed in his chest or the jet mode cockpit, instead we get this cheap looking children's party mask. 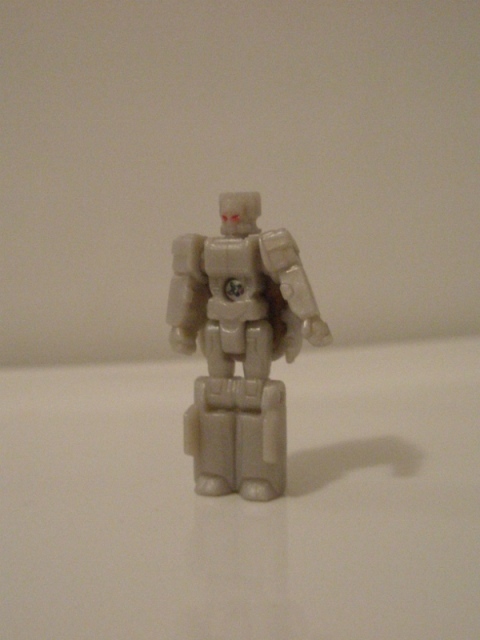 Nucleon is cast in solid grey plastic and looks incredibly plain. The waxy grey plastic used smothers a lot of the detail and makes him look constantly out of focus. The daubs of red paint on his eyes don't help, being a less than impressive effort to pick out some detail. They may as well not have bothered and spent the money painting up Galvatron's face. Plus; Nucleon? Really? Never blessed with the most striking of alt modes, the cannon mode is a bit of a dumpy mess. The robot mode legs don't really clip together solidly enough for my liking and give the back of the thing a huge amount of bulk. The huge amount of underkibble caused by the jet mode nose also rob this of looking convincingly like anything. The jet mode, spacecraft, whatever... is exactly that, a pile of whatever trying to pass itself off as a legit third mode. It's a clumsy arrangement of robot mode parts and tank treads that utterly fails and just leaves you wondering why everything in the Voyager price point had to be triple changer. 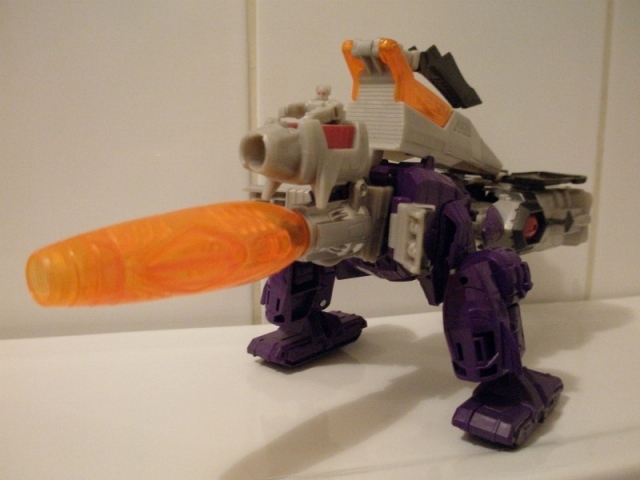 I'd have been happy enough for Galvatron just to have turned into a decent representation of his canon mode which Nucleon could pilot, rather than this turd.